Guys, this post almost didn't happen. Want to know why? Because I was too busy spooning mouthfuls of this delicious, creamy pumpkin crème brûlée to stop and take photos. And by the time my friends got in on the action, there were only a handful of ramekins left for the shoot. Luckily, I'd had some foresight to squirrel some away before sharing them with everybody else. And to think that, a year ago, I was convinced that I didn't like pumpkin. And to be honest, I'm still not sure that it's my favorite thing. Blasphemous, I know, but I'm just not a fan of pumpkin pie spices. Often times, I find that the excessive use of allspice, cinnamon, clove, ginger and nutmeg drown out the flavors of pumpkin. It wasn't until this time last year, when my coworker brought in her delicious pumpkin bread, that I was convinced otherwise. Her pumpkin bread was unbeatably moist, with a tender and soft crumb. But what was most surprising was that it had such a strong flavor of pumpkin. She admitted only using a teaspoon or two of other spices, therefore making pumpkin the main event of her bread. And that's why I actually liked her bread — I could actually taste the pumpkin! With that in mind, I've been experimenting with my own pumpkin spice recipes in order to find the perfect spice combination that's more suited to my tastes. I recently made a pumpkin roulade that was flavored with cinnamon and cream cheese frosting, and not much else. Although I loved the way the creamy texture and the vanilla flavor of the cream cheese frosting complimented the pumpkin cake, I realized that the pumpkin cake needed an extra kick besides cinnamon. But I wasn't sure what, exactly. A spicy spice like nutmeg and ginger would push it too far into pumpkin pie spice territory, but what other alternatives were there? 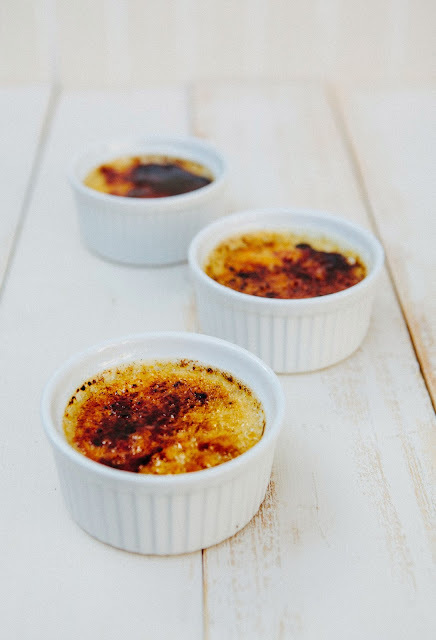 When I came across this recipe for pumpkin crème brûlée, I was surprised that it had paired pumpkin with vanilla and not too much else. And I realized that might be the sort of thing directly up my alley. 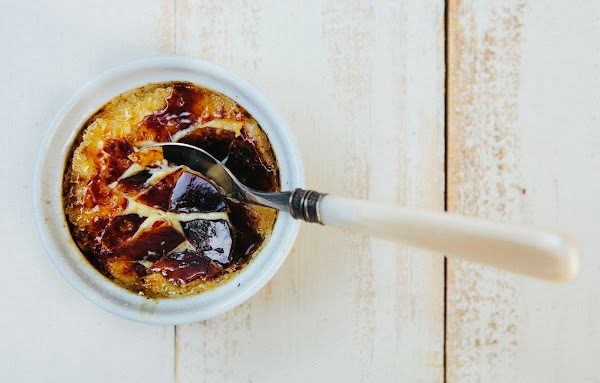 Because who could deny the contrasting textures of the creamy custard and the brûléed caramelized sugar? In this partticular case, the burnt sugar of the brûlée does a wonderful job of complementing the pumpkin flavor of the custard, adding an exotic kick that a spice like allspice or nutmeg always failed to do. Together, the two flavors almost taste like a deep, delicious caramel. As for the flavor of the custard itself, the pumpkin added a subtle yet unique and delicious flavor to the vanilla custard. To wit: I handed a ramekin to my roommate, who was reluctant to try it in the first place since he wasn't a fan of pumpkin spices either. After taking a few tentative bites, he decided to take a whole ramekin for himself, saying "Wow, this is really good. You can tell that the pumpkin is there, but it's not overwhelming or anything. It goes really well with the custard." I couldn't have put it better myself. So with this recipe, it looks like I've found my ideal set of flavors to complement fall's favorite pumpkin ingredient: vanilla, caramel, and a whole load of burnt sugar. Do NOT overcook the custard. Overcooking will result in a weirdly crumbly and grainy custard texture and me crying tears of sadness for you. If you know your oven runs hot, constantly check your ramekins to see how done they are. 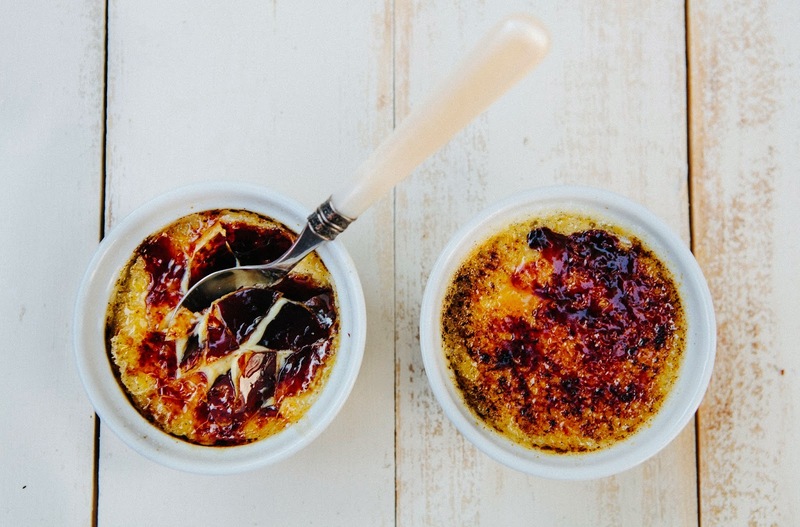 Custards, unlike cake, are unaffected by the number of times you open your oven door. 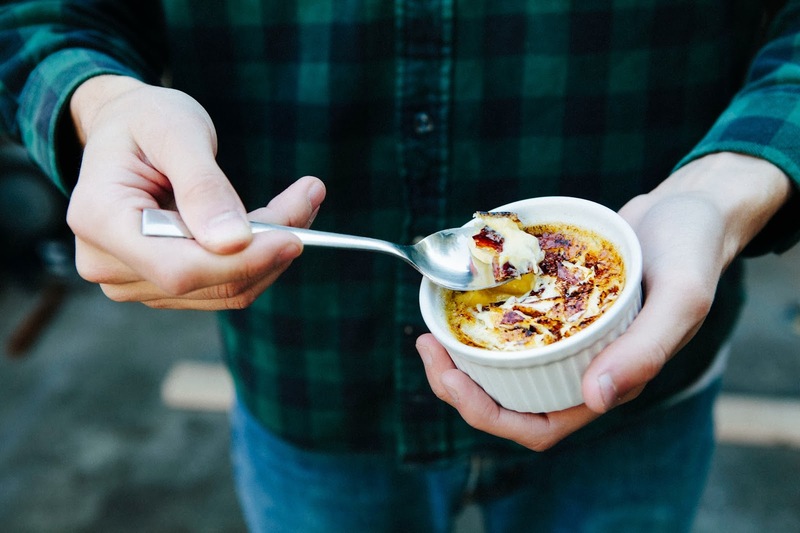 You can find the perfect custard texture by taking a heatproof utensil and giving each ramekin a gentle tap on its side. If the sides are firm but the center jiggles, you're good to go. If the center is firm, you've overcooked your custard. In a medium heatproof bowl, whisk together 1/2 cup granulated sugar and 5 egg yolks until well combined. Set aside. In a medium sauce pot, combine 1 1/2 cups heavy cream, 1 cinnamon stick, a pinch of nutmeg and a pinch of salt. Split open 1 vanilla bean pod lengthwise and use the tip of a knife to scrape the vanilla beans into the cream mixture. Once you have "deseeded" the pod, add it to the sauce pot. Bring the mixture to a simmer over medium heat, whisking occasionally to prevent the cream from forming a skin. Once the cream is simmering, remove from heat. Slowly whisk the hot cream mixture into the yolk mixture (from the 2nd step) through a fine mesh sieve until well combined. Once the cream mixture is combined into the yolk mixture, whisk in 3/4 cup pumpkin puree until well combined. Divide the mixture among 8 four-ounce ramekins and place in a large baking pan. Add boiling water to fill the pan halfway up the sides of the ramekins. Cover the pan loosely with aluminum foil and bake until the custards are just set, around 30 minutes. When the custards are done, the center should be a little bit jiggly but the edges should be set (see baker's notes). Transfer the ramekins onto a wire rack and let cool to room temperature. Cover each ramekin with plastic wrap and refrigerate for at least 4 hours, or up to 3 days. Just before serving, prepare 1/2 cup granulated sugar by processing in a food processor. This will break up the sugar crystals and turn your sugar super fine. Sprinkle 1 teaspoon of superfine sugar evenly over the surface of each custard. Use a chef's torch to move a flame continuously over the surface of the sugar until the sugar melts and lightly browns. Let rest for a minute to allow the sugar molten to harden, before serving immediately. 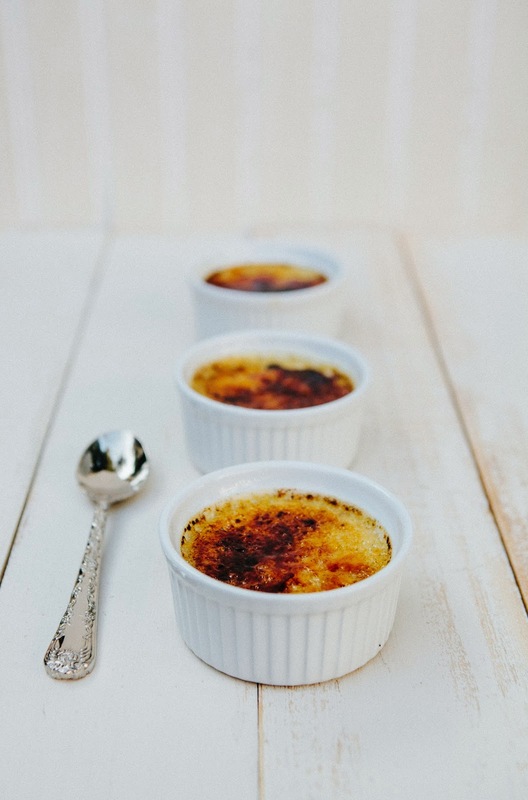 Love creme brûlée, and especially love when people put a new spin on it. Two of my all time favorites were: maple creme brûlée at Loon Lodge in Rangeley, Maine; and lemon creme brûlée after a marvelous salmon dinner at Higgins in Portland several years ago. Your recipe with pumpkin and vanilla sounds divine. Michelle, do you think these could be made in one big pan (like a cake or tart or 8x8 pan) instead of ramekins? Or would that make it difficult for the center to cook? I just don't have 8 ramekins, but I want to make these!! That being said, ramekins are pretty cheap to buy (I think they are less than $2 a piece at Sur La Table, which means you can probably get them cheaper elsewhere). But if you really don't want to buy more ramekins, you can use coffee mugs! Just make sure that they are ovenproof — most plateware will say so at the bottom. 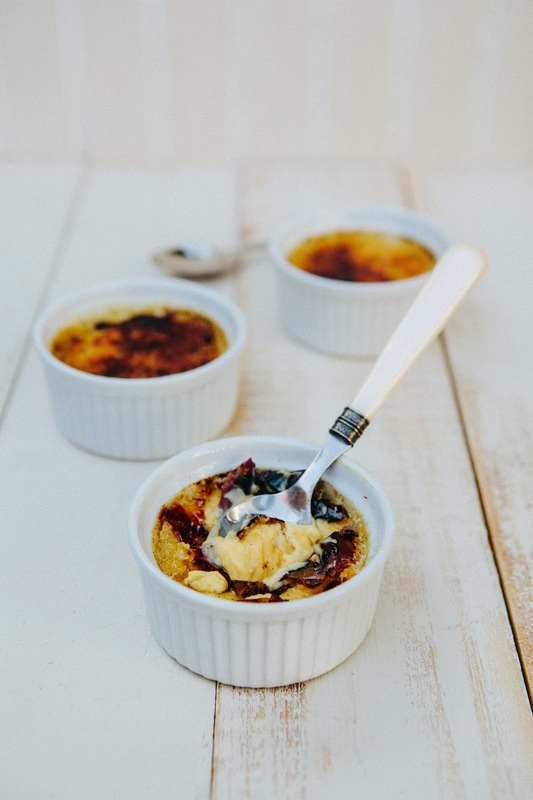 This creme brulee is calling my name! !